By now, I think most of us have heard of JustFab. For those who haven't, JustFab is an online retailer that sells shoes, clothing, handbags and other accessories, as well as a "subscription" service that gives a discounted price to VIP members. Technically you don't have to pay for VIP membership, but unless you buy an item or "skip the month", they do charge you (though you get to use that charge toward a purchase). I'm guessing they make pretty good money on those who forget to skip the month and don't spend those credits. Me? I love a good deal and I am the queen of calendar reminders, and I wasn't interested in paying $98 for the sweater cuff boots I wanted from Torrid. (I also wasn't sure using Haute Cash was worth it either, since my last pair of Torrid boots fell apart after two weeks). I figured I would just keep the VIP awhile, see if I wanted to buy more things and just set a monthly reminder to "skip". 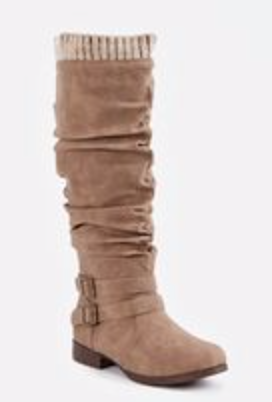 I found the Pilar sweater cuff boot, and joined the VIP so I could get two pairs for $39.99. I got one pair of black and one pair of taupe. Worth it, and I love the boots. I actually recommend the boots. They're super cute, comfortable, hold up well and just get better as they get worn in and beat up. However, I cannot reccomend JustFab themselves. First, I generally wear between an 8.5 W and 10 W depending on the shoe. I tend to go a bit bigger with boots so I can wear thicker socks. When I placed the order, I selected a size 9W for both pairs. Immediately after placing the order, I saw that for some reason, the taupe pair was showing up as an 8 regular. I contacted them, and was told that I couldn't change the order and would have to sent the boots back once I got them and exchange. Sure, whatever. I get the boots, and immediately re-pack the taupe boots up and try on the black boots. One fit perfectly, and the other I couldn't get up my leg and it felt really tight. Turns out one of the boots is a 9 regular and one is a 9W. I immediately contact JustFab and after some back and forth with an agent that didn't seem to understand what the problem was, we set up the exchange. Unfortunately, now the only size they had in stock for both colors was 10W. Based on the fit of the 9W, I decided I could work with it, and okayed the exchange and sent the two pairs back that day. A bit over a month after placing my original order, I finally get the replacement boots. The black boots came correctly. They're comfortable with thick fall-friendly socks. The taupe boots? Two different sizes. Yes, two different size boots again. This time, one is the 10 W and the other is an 11 W.
Upon contacting JustFab, they expected me to again, return the boots and then once received, wait for a replacement. Unfortunately, I wouldn't be able to get ANY color in Pilar Sweater Cuff boot as a replacement, I would have to pick a whole new boot. Except... nothing I wanted was available in my size. I opted to keep the mismatched boots since a pair of thick socks made them wearable, but I am appalled at the lack of quality control that resulted in me receiving two pairs of mismatched boots for the same order, and the fact that I had to wait over a month to even have a product in hand due to the company's mistakes. One star because they did ultimately replace my first order, but the lack of overall good service and quality control, particularly with a VIP account model is ridiculous, in my opinion. JugglingZen. Awesome Inc. theme. Powered by Blogger.